I began Star Ocean 5 being talked at by some dude while I could freely run around — but only to a point. You know how sometimes there’s an invisible wall blocking your path? Well, kids, this is the new generation and we’ve got new technology. Instead of an invisible wall, a red glowing line will appear on the ground. The future has arrived, and it’s a red line on the ground, past which you temporarily cannot run. At some points, my party could walk scriptedly forward across the line, while I was left confined to the other side of it. But why did this weirdly stick out? I don’t know. Let’s talk about it, you and me. It’s not the first game to allow players to run around while someone is talking to the character. It’s not the first to do so while every single other person on screen is standing still as a statue. I can’t say, really. It’s a gut thing. Something in my gut didn’t feel right, and it wasn’t Square Enix producers repeatedly punching me in it this time. Perhaps it was that running around served no purpose and wasn’t fun? Battles were very Star Ocean. Pressing X sent my character pathfinding toward an enemy; when he arrived at his destination, he’d attack. One time, he did facedoof into a rock and stumble backwards, which I found amusing. Combat seemed fun, though it’s hard to see the full depth of it in a demo. I put the controller down at two different points to see if the AI would straight up with the fight. The first time, they did; the second time, it was Game Over. Interesting. 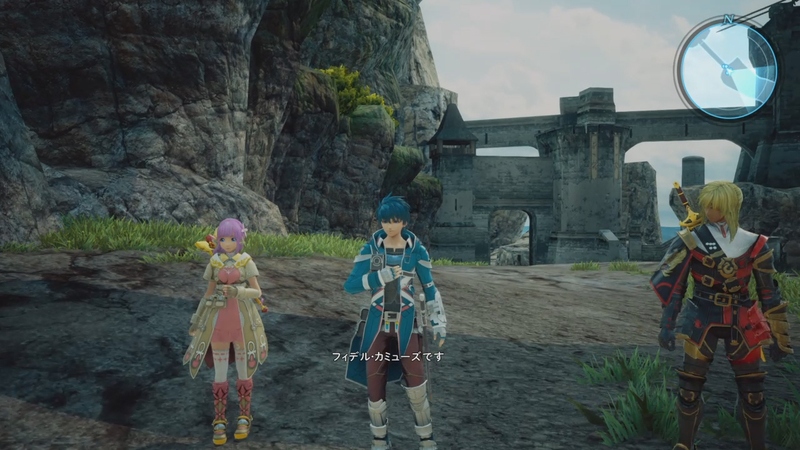 Though on PS4 hardware and on a beautiful TV, faces on Star Ocean 5‘s characters looked a little grainy. It’s like the opposite problem of most games in that I find the screenshots and videos looking better than what I played. Actually, SO5 failed to impress. Foliage and other details looked like someone had a level editor with one or two “grass” pieces and just picked randomly which grass asset to put in which piece of the map. Is this a symptom of being held back by cross-gen? RPG demos ever being sucky as they tend to be, Star Ocean 5 didn’t do much for me. Given only 15 minutes with it as I was, I of course couldn’t really dive deep into what makes a Star Ocean game, well, Star Ocean. The only things I could see in that time were the bad and the maybe-good-or-bad. You might find Star Ocean 5 either good, or bad, or okay. Remember: you heard that here first. More Tokyo Game Show stuff is rolling in here.